First, Westport's Chad Knight socked a towering home run to left field, then Harry Azadian followed with a blast of his own to right. The rout was officially on. Behind four home runs and another dominant start on the mound, Westport's 12-year-old all-stars crushed Coginchaug 9-1 on Sunday at Recreational Park in Plantsville to win the Little League state title. One day after Knight struck out 14 Coginchaug batters in an 8-2 win to open the best-of-three series, Azadian, too, was overpowering. The right-hander struck out 11 in 4 2/3 innings to lift Westport into the New England Regional for the first time. "The kid can just pitch," Westport manager Tim Rogers said of Azadian, who struck out the side in each of the first three innings. "He's been dominant, as has Chad." Westport -- 12-0 dating back to the start of pool play -- will open the regional against South Burlington, Vt., on Friday in Bristol at 8:15 p.m.
"We like where we are," Rogers said. Westport jumped on Coginchaug starter John John Jose's fastball from the start, getting back-to-back home runs from Knight and Azadian to jump ahead 2-0 after one inning. "We knew (the fastball) was his predominant pitch -- not a lot of offspeed stuff," Rogers said, referring to Jose. "We really geared up for it. We really dialed up the batting practice. ¦ The key is, with somebody throwing that hard, just make contact." Westport did just that, recording eight hits -- five for extra bases -- in five innings. "He was throwing (the fastball) most of the time, so that's what we were aiming for," said Azadian, who drove in a pair of runs. Matthew Brown supplied much of the offense, smashing a two-run double and a solo homer in two plate appearances. "We tried to just make contact," Brown said, "because we knew (the ball) would go." Jose pitched four innings, walking five with two strikeouts. Ryan Genest pitched the fifth in relief and allowed a solo home run to Chris Drbal to cap the scoring. Coginchaug trailed 3-0 after two innings, then saw its deficit balloon to 6-0 in the third. The all-stars struck out nine times over the first three innings against Azadian, before scratching out their only run in the fourth on a Connor Rulnick single. By then, it was already too late for Coginchaug, which combined for just nine hits in the two games. 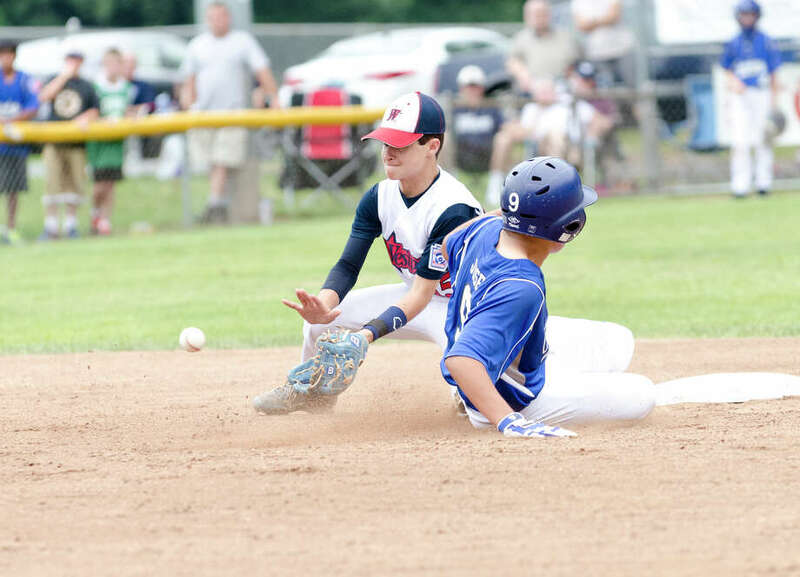 "They have two real stud pitchers," Coginchaug manager Ken Vallone said. "We knew we were up against it, and they just did what they had to do. We just couldn't find an answer for it." Azadian walked a batter with two outs in the fifth before he was replaced by Charlie Roof. The right-handed reliever allowed a hit and one walk in 1 1/3 scoreless. When the day was complete, Azadian was savoring the moment. "I'm feeling amazing. I imagined this as a kid," Azadian said. "This is a dream come true right here." The game also served as a bittersweet end for Coginchaug, which lost in the state final last summer at the 11-year-old level. "It's tough in one way, but I am so proud of these kids," Vallone said. Batteries: C -- John John Jose (L), Ryan Genest (5) and Connor Rulnick. W -- Harry Azadian (W), Charlie Roof (5) and Matt Stone. Home runs: W -- Chad Knight, Azadian, Chris Drbal, Brown.